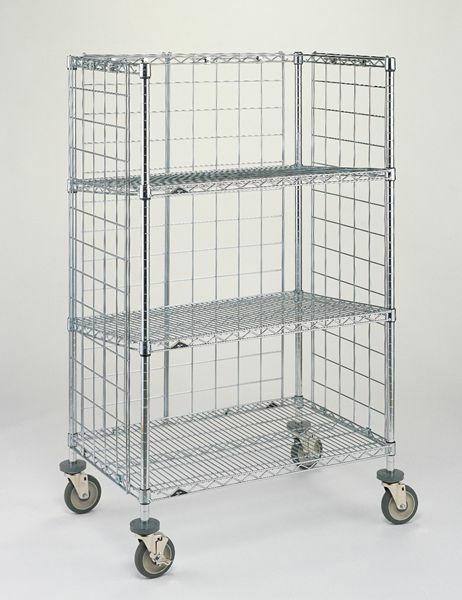 Latest Products carries a complete line of shelving units in a variety of materials and sizes. Our shelving units are an invaluable source for storage. Choose from our chrome shelving units which come with either 4 or 5 adjustable shelves, which can be positioned with ease in 1 inch increments. Or choose from one of our other popular materials, such as our epoxy coated wire shelves treated with Microban antimicrobial protection. If you need to transport your items throughout your facility, our movable shelves, dunnage racks and stem-caster carts, can accommodate all of your needs. Choose from open units or purchase our enclosures so keep contents from falling off shelving. We have many options to suit your needs. Shelving accessories and cart covers also available.